Mailbox Monday is the gathering place for readers to share the books that came into their house during the previous week. Warning: Mailbox Monday can lead to envy, toppling TBR piles and humongous wish lists! Mailbox Monday, which was started by Marcia at The Printed Page, is on blog tour—and Lady Q at Let Them Read Books is hosting during the month of December. 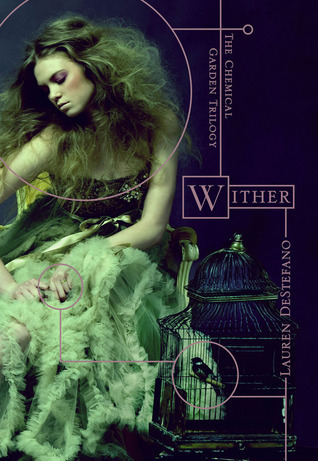 The sole item I received last week was Wither (The Chemical Garden Trilogy) by Lauren DeStefano, which I received from the publisher for review. SYNOPSIS: Thanks to modern science, every human being has become a ticking genetic time bomb—males only live to age twenty-five, and females only live to age twenty. In this bleak landscape, young girls are kidnapped and forced into polygamous marriages to keep the population from dying out. When sixteen-year-old Rhine Ellery is taken by the Gatherers to become a bride, she enters a world of wealth and privilege. Despite her husband Linden's genuine love for her, and a tenuous trust among her sister wives, Rhine has one purpose: to escape—to find her twin brother and go home. But Rhine has more to contend with than losing her freedom. Linden's eccentric father is bent on finding an antidote to the genetic virus that is getting closer to taking his son, even if it means collecting corpses in order to test his experiments. With the help of Gabriel, a servant Rhine is growing dangerously attracted to, Rhine attempts to break free, in the limted time she has left. That is my Mailbox Monday. What goodies arrived in your mailbox last week? Yay! I'm not certain HOW I got this, but I'm happy that I did! (shh...don't tell anyone, but I may push it up a bit in the review pile just to get to it sooner! LOL!) Enjoy! Wither? I'm envious :) Enjoy!